There is a huge range of interactive displays available from a variety of manufacturers including SMART Technologies, Promethean, C-Touch, Clever Touch, ViewSonic just to name a few. But what are the key factors that your school should consider before deciding on a best value interactive display? Interactive displays are becoming a popular and common addition to the classroom. 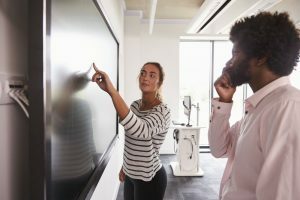 As a long-established supplier and installer of AV hardware in education SchoolCare have a wealth of knowledge and experience in this technology as it has developed over the last few years. It has taken a few years for the market to settle down from the high end, high priced units first available to the more sensibly priced classroom friendly options that are now available. At SchoolCare we have seen many interactive display demonstrations by lots of manufactures and most come bundled with their own software packages which when demonstrated will seem easy to use and suitable for all your teaching requirements. Schools should be careful and ensure that the software does what you need and want it to do! Manufacture demonstrations are designed to make the software package and the screen look amazing. If you get the opportunity try and test the software package yourself in ways that you will use it in classroom scenarios. If the school are looking to potentially change manufacture due to cost and software advantages, it’s also worth checking to ensure that the existing software file types can be opened and used in the new software so teachers don’t have recreate their interactive lessons. SchoolCare have worked closely with schools over the last 35 years and have installed thousands of interactive whiteboards and interactive displays so as a company we understand the importance of having great and functional software that supports your teaching requirements. Contact us today to discuss and arrange demonstrations of key interactive displays so you can decide which manufacture is best for your school.